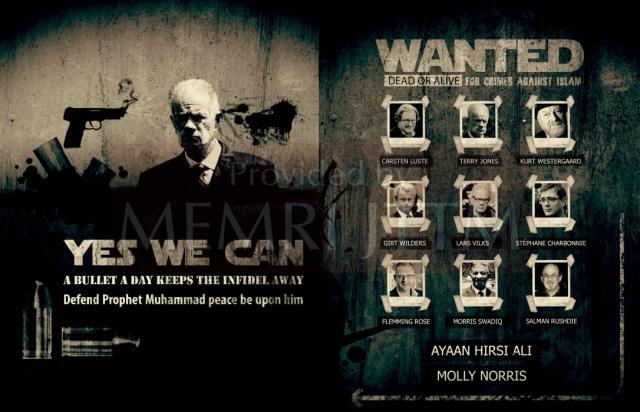 Al Qaeda has published a "Wanted: Dead or Alive Poster," listing several people guilty of "crimes against Islam." According to the poster, Muslims are to "defend Islam" by murdering Ayaan Hirsi Ali (who helped make the film "Submission"), Terry Jones (Qur'an-burner), Molly Norris ("Everybody Draw Muhammad Day") and several others. A caption reads: "A Bullet a Day Keeps the Infidel Away." Apparently, Al Qaeda hasn't realized that Islam is a religion of peace, tolerance, and sugar-coated raindrops. We can all expect CAIR, ISNA, and other Muslim organizations to immediately spring into action. Instead of sitting around all day complaining about "Islamophobia," Western Muslims are going to tirelessly devote themselves to correcting the violent views of their fellow Muslims. In the meantime, my unicorn and I are going to finish having lunch with Elvis. All the pictures are of men??? That is SO sexist! I'm filing a complaint! But, but, but, the prophet is dead and buried. As with all evil ideologues it is ideas that they hate the most. None of those selected are soldiers or generals, but all have given voice to the idea that Islam is a dangerous concept unworthy of humanity. Islam is driven by the myopic narcissists and we must not be intimidated by such criminals. Ideas do change people. They all seem very infidel-a-phobic don't they! Here once again we have pamflets of muzzies saying "defend prophet muhammad" rather than "defend Allah". Who was their god again?